August 20, 2008 Willits, CA – Friends, fans and supporters of Seabiscuit are invited to tour Ridgewood Ranch, home and final resting place of the horse racing legend in Willits, CA, on October 11, 2008 and to show their support for Glen Ellen Vocational Academy, an equine retirement foundation operated by Pam Berg in nearby Sonoma County, California. 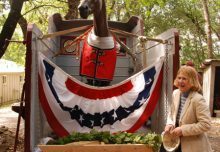 The event is sponsored by the Seabiscuit Heritage Foundation and Willits Chamber of Commerce. 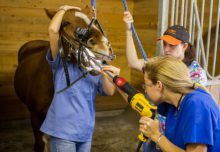 Berg and a handful of volunteers are rescuing and providing care for injured and retired thoroughbreds so that they may recover and return to riding soundness, just as Seabiscuit once did under his trainer Tom Smith. Tom Smith’s nephew James Watkins along with his wife Lucy are both avid supporters of GEVA and help provide sponsorships for individual retired horses. GEVA was founded to provide homes for injured, retired, and abused horses, or horses just in need of a home. Representing the Seabiscuit Heritage Foundation will be Jacqueline Cooper, owner and breeder of American Legend Horse Farm which is working to preserve the Seabiscuit bloodline at Ridgewood and the President of the foundation Tracy Livingston. Seabiscuit Heritage Foundation is a 501 (c) (3) nonprofit organization formed to promote the cultural legacy of the Ridgewood Ranch through historic preservation, environmental conservation and public education. Nestled in the oak and redwood-studded ranchlands and mountains of northern California, Ridgewood Ranch was where Seabiscuit recovered after sustaining a suspensory ligament injury. His recuperation set the stage for an electrifying blaze-of-glory career finish at Santa Anita Park that captivated Depression-era America. Owner Charles Howard was also one of the initial investors of Santa Anita Park in 1933. Washoe Valley Sal, a Seabiscuit descendant, will also be making an appearance at Ridgewood. “We are very happy to support Pam Berg in her rescue efforts.” said Cooper who purchased a stallion season for SEA OF SECRETS donated by Ballena Vista Farm to benefit Glen Ellen Vocational Academy earlier this year. Ballena Vista Farm is a full service Thoroughbred breeding operation located in Ramona, CA. WASHOE VALLEY SAL was bred to Sea of Secrets and recently returned home to Ridgewood where her famous ancestor once trod. The resulting foal due in April will be the first of the Biscuit line born at the historic Howard mare barn once part of the Howard’s first class Thoroughbred breeding operation in over 50 years. “I think you will be very happy with the baby Sea of Secrets and Sally produce.” said Vicki Rasmussen, Office Manager at Ballena Vista Farm. Sea of Secrets (Storm Cat-Love From Mom, by Mr. Prospector) is ranked Top-5 California Sire by winners & SWs. 2007 Earnings of $2.7 Million 5 SWs, 10 Stakes Horses in 2007, including Del Mar SW SEASIDE AFFAIR. Sea of Secrets is one of many quality stallion seasons offered annually at online auction to benefit GEVA. Thoroughbred breeders are encouraged to check back online this fall for the 2009 Auction. Yet another great roster of stallion seasons is anticipated. Donations for Glen Ellen Vocational Academy are also accepted and help provide feed, housing, and care for the horses of GEVA. GEVA inc. is a nonprofit organization with a 501 (c)(3) status granted by the IRS. Donations to the foundation are TAX DEDUCTIBLE. High resolution photographs are available upon request.